Meet Tiffannie and John! Hailing from Vancouver, Canada, Tiffannie and John have been preparing for their big day by traveling the world and getting their wedding and engagement sessions done. Having last been in Paris, France, they knew the next place they wanted to shoot in was the Big Apple- New York City!! 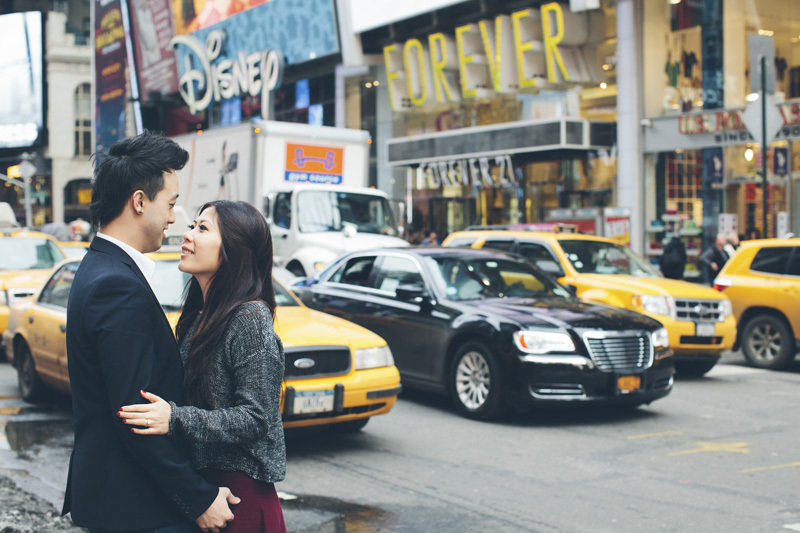 So they called me, their New York City Wedding and Engagement Photographer, and wanted to get the most "New York" spots they could. So we decided on Times Square, Grand Central Station and of course Brooklyn's finest Bridge! It was a extremely cold day (as following the tradition of the NYC 2014 Winter Polar Vortex year) and Tiffannie was a super-trooper, her final words for the shoot (even though she was freezing on the top of the bridge was), "It's all worth it!!!" Such an encouragement :) Here are some of my favorite shots from the shoot all over New York City! !